Relationships in westerns???? At first the very idea seems incongruous–after all, they’re westerns for Tonto’s sake, not kissy-fests where people talk about feelings. But as part of the greater romance genre, they’re only leather chaps away from the bodice-ripping paperbacks* commonly called romances. So let’s get in touch with our get-in-touch-with-our-feelings side and talk about some relationship westerns. 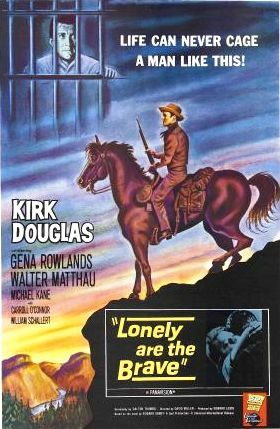 Directed by David Miller and starring Kirk Douglas and his femme fatale horse, Whiskey. He just couldn’t give up his horse…until it was too late. The highway-crossing scene always makes me cry. Westerns tack on a love interest in the most cursory way. And he often leaves. Or she dies. Or stays with her husband. Sheesh. Is there no hope for monogamy? Nothing here. Woman with woman: Oh. My. God. 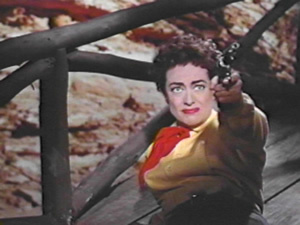 That was truly my reaction when I saw the fantastical Johnny Guitar. 1954. Directed by Nicholas Ray, with baroque abandon. Starring Joan Crawford, Sterling “I am a stranger here myself” Hayden, and Mercedes McCambridge. Yes, it would be heavy-handed to pronounce this a lesbian western. But there is something about the way Hayden stays in the background and the macho but fem Crawford has to have a showdown with the butch McCambridge. (Spoiler alert) I seem to recall McCambridge dying, so maybe there just isn’t any hope here either. Man with man: OK, OK. EVERY western that shows two men sharing a can of beans and a campfire. Or the bestest relationship movie ever, so sad it stomps all over Love Story with spurs on, and that just happens to be about a gay relationship: Brokeback Mountain. ‘Nuff said. Directed by Ed Harris, and starring Ed Harris and Viggo Mortensen. Oh, and Renée Zellweger is in there somewhere. 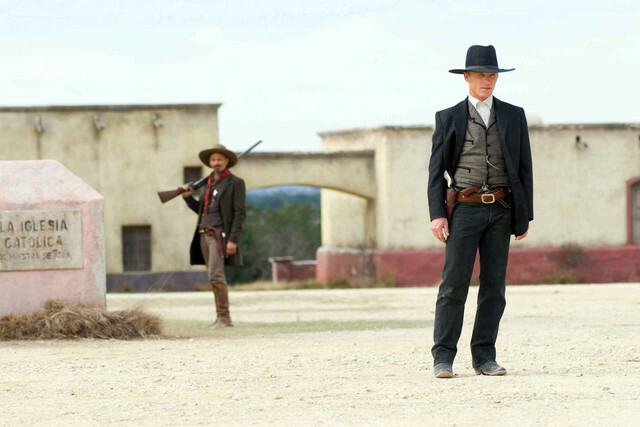 This is quite a serviceable western*****: it has dust and sweat-stained saddles and gun fights and guys that are bad guys but good when you compare them to the truly bad guys, etc. What gives it some class is its lack of archness, that same archness that gets pretty tiresome when it refers to latent homosexuality in westerns. ** But neither is the movie a boneheaded assault on our refined sensibilities. These men have a relationship, bucko. Viggo and Ed are married. Well, not in a church way. In a fundamental way. They finish each other’s sentences–they even have the same rhythms of speech and walk. They try not to hurt each other’s feelings,and anyway, they don’t talk much. Viggo sews socks and Ed provides the macho eye-squinting thing that’s needed in any good relationship. *** And one of them (spoiler alert) soberly but with a sense of duty and self-worth, sacrifices his own happiness for the other, which happens in marriages–sometimes in big ways and sometimes in small everyday ways. They wuv each other in a believable and unsentimental way. (spoiler alert) But damn it all! One of them leaves town. Are there no good relationships in westerns???? ** note to self, this means you! *** this can be either partner. *****Appaloosa is a fine western all around. It has men who look great in holsters and pitched gun battles that seem true-to-life: the violence is over before anyone can blink and everyone looks a little embarrassed and shocked by it. This reveals my true western nerdness but here goes: even the pitch of the gunfire is different from most westerns. Rather than rolling epic gun blasts, the sound of the shots is flat and brief, horrifying in its mundaneness. Additions: My own cowboymate offered these westerns as highlighting the joys of monogamy. Hooray! The Magnificent Seven: the hotshot Mexican gunslinger (played by a hunky German) chooses a beautiful peasant girl and domesticity over Yul Brynner. Naked Spur: James Stewart is OBSESSED. But the love of a good woman makes him human again. and the ULTIMATE: High Noon. From theme song to final credits, this movie says what true love will do. Grace Kelly, playing a Quaker bride, gives Gary Cooper the hard choice: if you resort to violence to do your duty, I will have to leave you. The twist comes when she chooses to save her man, having to resort to violence. Rather than a sardonic commentary on the weakness of pacifism, it’s a stunning pean to what you have to do for love. And she stays with him, too. see I thought of High Noon too! Which was one of the movies that changed/ruined my false-premise based life/ happy existence — I suddenly realized that the sun was going down and they were together and then wait what about the morning? or the next morning? or the next year? Watching High Noon was when I woke up and realized that relationships were NOT movies. this is sooooo depressing. especially about the horse. I’m going to go have a relationship with a can of soup. Tell Them Willie Boy is Here: How about this relationship in a Polonsky ’60s epic. Sheriff (Robert Redford)and his vengeful posse chase Indian Willie Boy (Robert Blake) and his love Lola (Katherine Ross)across miles of desert until Willie finds it better to kill Lola himself rather than abandon her to the posse. Is this foreshadowing or what? Horrors! A classic do-wrong movie and foreshadowing beyond compare. As CO said, relationships are not movies, yet Mr. Blake borrowed from the script on this one. Thanks for the comment and if your eye is astute as it seems, sounds like your book deserves the prize. A shoot-out is the literal and figurative climax of the western, isn’t it….